Jeremy Rifkin is the bestselling author of twenty books on the impact of scientific and technological changes on the economy, the workforce, society, and the environment. His books have been translated into more than thirty five languages and are used in hundreds of universities, corporations and government agencies around the world. In 2011, Jeremy Rifkin published the New York Times bestseller The Third Industrial Revolution, which captured the attention of the world. Mr. Rifkin’s vision of a sustainable, post carbon economic era has been endorsed by the European Union and the United Nations and embraced by world leaders including Chancellor Angela Merkel of Germany, President François Hollande of France, and Premier Li Keqiang of China. 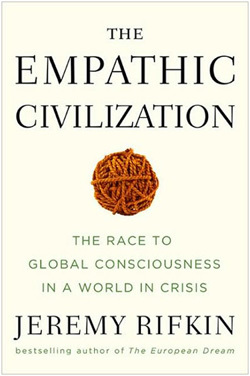 Mr. Rifkin’s other recent titles include, The Empathic Civilization, The Age of Access, The End of Work, The European Dream, The Biotech Century and The Hydrogen Economy. Jeremy Rifkin has been an advisor to the European Union for the past decade. Mr. Rifkin also served as an adviser to President Nicolas Sarkozy of France, Chancellor Angela Merkel of Germany, Prime Minister Jose Socrates of Portugal, Prime Minister Jose Luis Rodriguez Zapatero of Spain, and Prime Minister Janez Janša of Slovenia, during their respective European Council Presidencies, on issues related to the economy, climate change, and energy security. He currently advises the European Commission, the European Parliament, and several EU and Asian heads of state. Jeremy Rifkin is the President of the TIR Consulting Group LLC, comprised of many of the leading renewable energy companies, electricity transmission companies, construction companies, architectural firms, IT and electronics companies, and transport and logistics companies. His global economic development team is working with cities, regions, and national governments to develop the Internet of Things (IoT) infrastructure for a Collaborative Commons and a Third Industrial Revolution. Rifkin has taught at the Wharton School's Executive Education Program at the University of Pennsylvania since 1995, where he instructs CEOs and senior management on transitioning their business operations into sustainable economies. Mr. Rifkin's monthly column on global issues has appeared over the years in many of the world's leading newspapers and magazines, including The Los Angeles Times in the United States, The Guardian in the U.K., Die Süddeutsche Zeitung and Handelsblatt in Germany, Le Soir and Knack in Belgium, L'Espresso in Italy, El Mundo and El País in Spain, Kathimerini in Greece, Informatíon in Denmark, De Volkskrant in the Netherlands, Hospodárské Noviny in the Czech Republic, Wort in Luxembourg, Clarín in Argentina, and Al-Ittihad in the U.A.E.